Beginning March 1, 2018, anyone within the District proposing to construct a well that is used to produce water from groundwater should complete a new Water Supply Well Permit application online. Please view these instructions before completing the application form. All applications for high capacity wells (those pumping greater than 50 gallons per minute) must be reviewed and approved by District staff before construction can take place. All new high capacity wells must be at least 600 feet from any existing registered water supply well. There are no fees required to submit an application. If you prefer to submit a paper copy of your application, please open the online application and select PRINT at the top of the form, then submit via email, fax to 402-895-6543, or send via mail. The Eastern Nebraska Water Resources Assessment (ENWRA) project was formed in 2006. The long-term goal of the project is to develop a geologic framework and water budget for the glaciated area of eastern Nebraska. ENWRA is using a variety of techniques, including cutting-edge Airborne Electromagnetic Survey (AEM), to map the geology and aquifers of eastern Nebraska. Please visit www.enwra.org to learn more about these studies and what we have learned. The District, in cooperation with ENWRA, is continuing efforts to map our subsurface geology and better define the characteristics of our groundwater aquifers using AEM technology. Focusing on an area in Sarpy County underlain by a shallow, perhaps isolated Dakota Sandstone aquifers, helicopter flights in August of 2016 were interpreted and documented in a final report in 2017. The project was supported by a grant from the Nebraska Water Sustainability Fund. 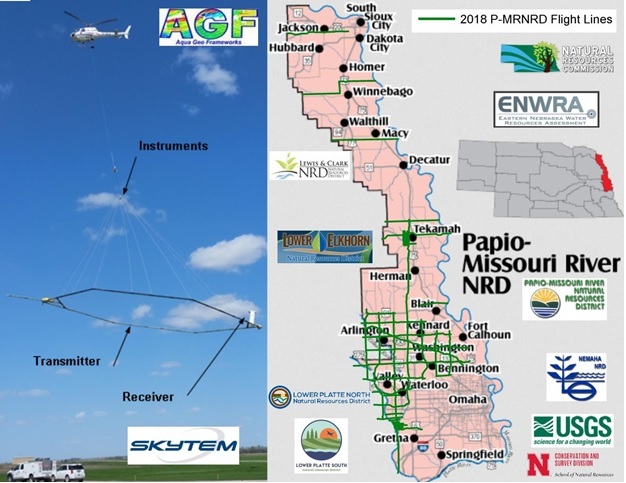 Following the 2016 AEM study, the Papio-Missouri River NRD is working again with ENWRA, and funding from the Nebraska Water Sustainability Fund, to collect geologic data across much of the District. The purpose of this 2018 AEM survey is to tie together past data in the Platte and Elkhorn River valley, identify the location and extent of sand and gravel deposits from an ancient river valley in southern Washington County, and map the geologic transition from the uplands to the Missouri River valley near Blair, Tekamah, Macy, Winnebago, and Jackson. The helicopter will fly along the planned flight lines, shown below, in late June and early July of 2018. Continue to coordinate with upstream NRDs and water users in the Platte River Basin to maintain a balance between current and future water supplies and demands. Accomplishments by the P-MRNRD and NDNR as part of the IMP in 2014 and 2015 are documented in separate reports available here. The IMP was jointly adopted by the P-MRNRD and NDNR in the fall of 2014. Following adoption, both agencies implemented controls through their own rules and regulations which restrict new groundwater or surface water irrigated acres in any given year. The P-MRNRD may only grant variances for new groundwater irrigated acres in a portion of the IMP area, see map , up to 2,500 acres each year and NDNR can only issue surface water irrigation rights for less than 833 acres each year. See P-MRNRD Groundwater Rules and Regulations and NDNR Associated Surface Water Controls. Landowners proposing to implement new irrigated acres or expand upon existing irrigated acres in the IMP area must submit an Application for a Variance to Expand Irrigated Acres. To ensure that the District has accurate records of existing irrigated cropland, landowners or farm operators within the IMP area are being asked to provide documentation to certify their irrigated acres. An early mailing to landowners was previously sent out, but since that time, the NRD has delineated approximate irrigated acres based on existing pivots or wells and will be contacting those landowners directly. If you know you still need to provide an application form or additional documentation, please download and complete the following forms.